The sections below describe the various ways that the presentation duration can be updated. Whenever the duration attribute changes value, the HTMLMediaElement.duration is updated to the same value and the appropriate durationchange event is fired on that object. The web application can explicitly set the presentation duration by setting the duration attribute. If any SourceBuffer objects in sourceBuffers has media data beyond the new duration, this data is removed from the SourceBuffer object. This ensures that buffered never reports any ranges beyond the current duration. If the current playback position is beyond the new duration, then update HTMLMediaElement.currentTime to the new duration and run the seeking algorithm. If the duration attribute isn't explicitly set before the first initialization segment is appended, then the presentation duration will get implicitly set. If the first initialization segment appended contains duration information then the duration attribute will be set to that value. If the first initialization segment does not contain any duration information then the duration attribute will be set to positive Infinity to indicate that duration isn't known yet. 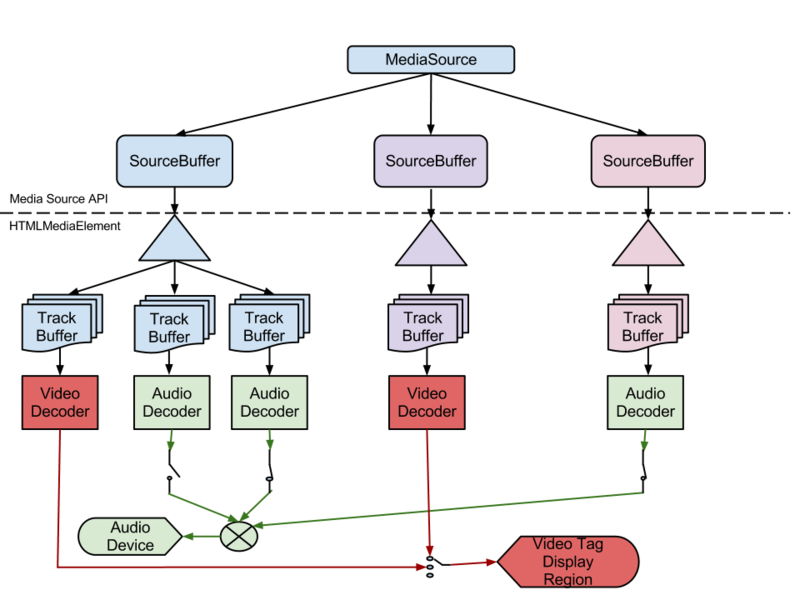 Any time a media segment that goes beyond the current value of the duration attribute is appended to a SourceBuffer, the duration attribute will get updated to end timestamp of the media segment. When endOfStream() gets called without an error, the duration attribute will get updated to the highest end timestamp across all SourceBuffer objects in sourceBuffers. This allows the duration to properly reflect the end of the appended media segments. For example, if the duration was explicitly set to 10 seconds and only media segments for 0 to 5 seconds were appended before endOfStream() was called, then the duration will get updated to 5 seconds. Remove all media data that is beyond the new duration from all SourceBuffer objects in sourceBuffers. Update HTMLMediaElement.duration to the new duration and schedule the appropriate durationchange event to fire. If the HTMLMediaElement.currentTime is beyond the new duration, set HTMLMediaElement.currentTime to the new duration and trigger the appropriate seeking behavior. Add the new object to sourceBuffers and fire a addsourcebuffer event on that object. Set the duration attribute to the highest end timestamp across all SourceBuffer objects in sourceBuffers. Set the duration attribute to the value in the initialization segment. Set the duration attribute to positive Infinity.